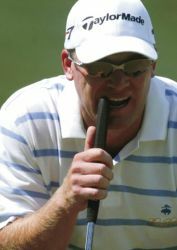 The Pro Golf Secret » Golf News Tripp Isenhour Kills! When was the last time that you heard a golf ball was used in a murder? Well pro golfer, Tripp Isenhour, has been the latest to kill with the highly unlikely weapon. In Orlando, FL, Tripp Isenhour was filming a instructional video and a noisy bird decided to settle in the trees above him and make as much noise as it possibly could. Tripp decides to stop filming in order to try and make the bird fly away. After getting very annoyed, and others as well, he decided to throw a golf ball in order to scare the bird away. He hits… the bird falls… and dies. While this may have been an animal cruelty case waiting to happen if there was a member of the ASPCA or PETA were around, it seems that was the least of his worries. The bird he just killed turned out to be a protected hawk, and now Tripp Isenhour faces up to 14 months in jail, and a $1,500 dollar fine.